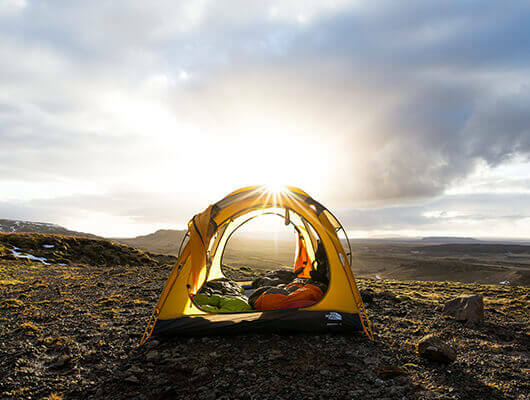 As we were going to make a one month road trip in Iceland, we wanted to test our limits and reduce our expenses by camping most of the time. Even if was winter – the winds can reach more than 120 km / h – it was not going to be our first rodeo. After all, that’s the reason why we travel: to immerse ourselves in nature. We discovered a beautiful hidden spot, a hot spring in the middle of nowhere, which seemed to be waiting for us. Exactly the kind of place you need to warm up and admire the beauty of what is around! We decided to stay there for two days, and enjoy the place to the fullest. Beeing campers, we were always trying to find a place not too exposed so as not to be disturbed, while arranging to have a nice view. We decided to set up our tents on a mountain about 1 kilometer from the source. The perfect spot. The setting sun, the panoramic view over the whole valley: one feels like being alone in the world. Once we finished settling down, we headed to the basins to spend the evening. The moment was too perfect, almost incredible, the true Icelandic dream. All of a sudden, the wind rose – and it started raining, obviously – a wind worthy of Arctic storms. No time to waste time, we rushed towards our encampment. 200 meters later, we were already soaking wet. We just wanted to get back to our warm and cozy sleeping bags. The nightmare began when we reached the top of the mountain and realized that one of the tents was gone…! Not too sure to understand what was going on, we started to panic. With that blackness, the rainstorm and a frontal light as only lighting, our situation was far from the best. 400 meters away from our camp, we finally saw our tent sliding slowly but surely towards the edge of the mountain. A few minutes later and it would have been goodbye to the tent and all the equipment inside it. We experienced relief and bitterness all at once! As we thought ourselves to be true pros of camping, we realized that we continue to learn at every single expedition. Completely soaked, we realized that one of our mattresses was holed. In addition, one of the stems of the tent, which visibly suffered from the adventure, tore the canvas. Lesson learned: never fix the pegs in the boulet and the sand! At least we managed to fix it all and to continue our journey without any problems. All this to say that, even if we think we have seen quite a lot of situations, nature always finds the way to put us back in our place and to remind us that we should never take it for granted!